Mallku Expediciones is your expert for expeditions to climb Mount Aconcagua and other mountains in the Andes. We are a family company for those who are looking for a more individual trip. We are a family of passionate climbers, and we see our guests as our friends. We welcome you from all over the world, from Mountaineer to Mountaineer. We support your expedition with tailor-made services. We are operating our business since 27 years, we know what we do. 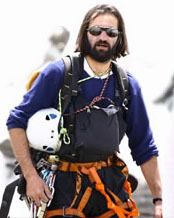 Victor Herrera is a professional Mountain Guide and the founder of the company 'Mallku Expediciones'. He was also founder and president of the Andinist Rescue Group of Mendoza, founder member of the Mendoza Association of High Mountain and Trekking Professional Guides and founder member of the Chamber of Aconcagua Provincial Park Services Leaders. Victor summited Aconcagua many times for different routes, excelling in the first world record in solitary and ascending in a day via the polish glacier. He also climbed other mountains in the Andes, Himalaya (Nepal) and Karakoram (Pakistan). He took part in the Expedition "Argentineans in Himalaya" in honor to the first Argentinean expedition to ascend Dhaulagiri (8167 m). He summited successfully on May 14th 2004. Victor is registered at the EPGAMT-Provinical School of Hight Mountain and Trekking Guides, Reg. No. 0011. The name Mallku has it's origin in the language of the Incas, in Quechua. Mallku stands for the spirit and the power of the mountains. The spirit of the mountains found it's physical presence in a bird, the Condor. This bird is one of the largest birds that can fly. It crosses our skies in the Andes and shows us it's majesty permanently. The Condor was therefore a sacred animal for the Incas. We try to keep that spirit of the mountains alive. ©2018 Mallku-Expediciones - Victor Herrera; Todos los derechos reservados - Está prohibido copiar, almacenar, reproducir o utilizar contenido! All rights reserved - It is forbidden to copy, save or use any content! - Alle Inhalte dieser Seiteunterliegen dem Urheberrecht - Es ist verboten Inhalte zu kopieren, zu speichern, zu vervielfältigen!